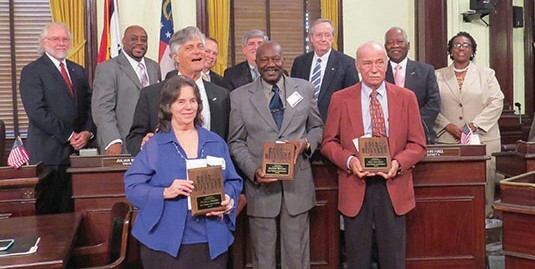 From left to right: Patricia Lennox Jenkins, Eugene Wright and Fred Hallaran are presented with the Good Neighbor Award during City Council Meeting. Three Savannah residents who strive to improve their communities and serve those in need were presented with Good Neighbor Awards today by City Council. The winners, announced during the regular City Council meeting, were Eugene Wright, Fred Hallaran, and Patricia Lennox Jenkins . The three were recognized publicly and presented with Good Neighbor Award plaques by Mayor Eddie De- Loach and City Council. The Good Neighbor Award is a way to recognize citizens who improve the quality of life in their neighborhoods every day through acts large and small. Good Neighbor Award recipients must be: • A resident of the City of Savannah • Have made contributions to their neighborhoods or to Savannah • Have demonstrated concern for their neighborhood’s well-being or overall quality of life for the City of Savannah • Not be employed by the City of Savannah To nominate a neighbor for the Good Neighbor Award, visitwww.savannahga.gov/ goodneighbor.